In the April edition of the St John's Parish magazine in 1936, Mr C W Knight gave a report of the St John’s Men’s Bowls Society. Play opened on St Peter’s Ground in May and with great regret after many happy years on Mr Booth’s hospitable green, the Club then crossed the road to The Helen Garden.The June edition of St John’s Parish Magazine gives the scorecard of match played under “artic conditions” on Saturday 2nd May 1936 when the Men’s Society beat the Church Council captained by the vicar on each of the two rinks. Other fixtures that season were United Police, Hailsham (home & away) Archery, Hampden Park & Motcombe. As yet, the location of St Peter’s Ground has not been identified. It is unlikely to be the grounds of St Peter’s Church, which was built in 1894 at the corner of Meads Road and Granville Road on the site of the present Redman King House, as this is hardly across the road from The Helen Garden. The Church was demolished in 1971. It is more likely that, like St Luke’s Children’s Convalescent Hospital, St Peter’s Ground was within the bounds of All Saint’s Hospital which was opened in 1869. The chapel was built later opening in 1874 and St Peter is prominent in the window of the Chapel of the Blessed Sacrament to the left of the high alter. It is there more than likely that, being a convalescent hospital it would have had areas for patients to exercise and take the air. Such areas would likely have been dedicated to saints and no doubt St Peter would have featured. St Luke’s Children’s Hospital was opened by the Prince of Wales in 1890 and was demolished in the early 1960’s to make way for Dolphin Court. The appetite for bowls undoubtedly changed following the outbreak of war in 1939. Little is known about our club during the war years but the focus of attention would understandably have been elsewhere, particularly after the bombing of St John’s Church on the afternoon of Monday 4th May 1942. Priorities changed and it may well be that the green was not maintained and, like the Eastbourne Open Bowls Tournament, play would likely have been suspended for the five war years. Our nearest neighbour, Bedes School (formally St Bedes School) was built in 1900. During the war the pupils were evacuated to Oxford and the building was used to train 2,000 telegraphists who specialised in enemy codes and cyphers. St Bedes moved back to the site on VE Day 1945. From August 1943 until their departure as part of the D Day landing in June 1944, Holywell Priory, the former home of the Countesse de Noailles, was the headquarters of 83rd Battalion of 2nd Canadian Infantry Division. The Pilot was their favoured hostelry and standing outside, clearly visible in the Priory boundary wall, are four slits similar to letterboxes through which guns could be poked at the enemy. By 1930 Holywell Priory was the home of Frederic Gomme Jonas, a shipbuilder born in Kilmarnock in 1861. He married Annie Marie Woods Burgess in 1892 in Wandsworth. Frederic died in 1937 but Annie continued to live at the Priory until it was taken over by the Canadian infantry in 1943. Annie lived to the ripe old age of 89 passing away in Hove in 1952. By 1951 Charles Brookes, a consulting engineer, lived at the Priory with his wife. In 1953 Holywell Priory became Holywell Priory Preparatory School, being demolished in 1956 to erect the 16 houses now known as Holywell Close. The principals of the school were Mrs M.K. Brooks and Mrs Gladys Hance, the wife of Herbert Hance, an active member of St John’s Bowls Club. However, in the club’s records Herbert is recorded as Peter. Gladys thought the name Bert common so insisted he call himself Peter. Gladys died in 1979. At Bert’s funeral in 1983 the name change caused confusion amongst the family with the service and members of St John’s continually referred to him as Peter. Herbert Hance, having no children, left most of his estate to his five brothers, but generously left a small legacy to the club. He also left a legacy to each of his nephews and nieces, but what reflects the sign of the times, each of his five nephew received £3,000 whist each of his six nieces only got £2,000. The distinctive design on the reverse of the above postcard was introduced in May 1937 and changed in July 1939. 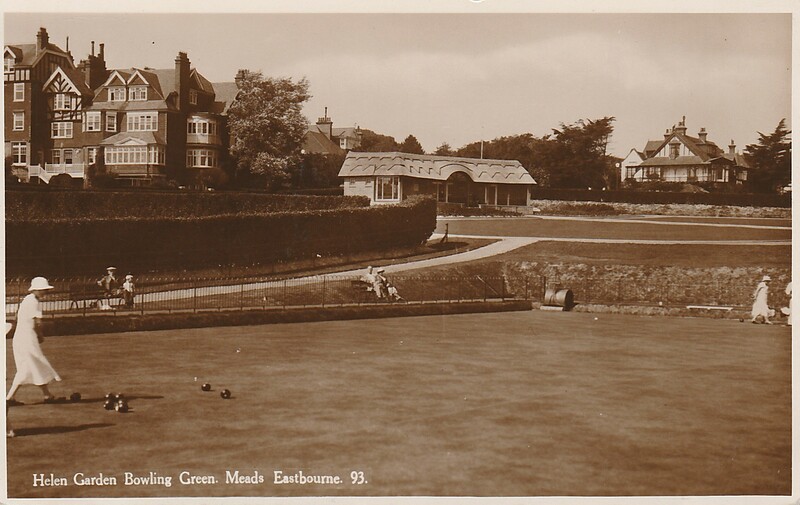 The postcard clearly shows ladies enjoying a game of bowls at Helen Garden. This lends some support to the Women’s Fellowship Section forming a women’s bowling group just before the outbreak of war. However, ladies were not allowed to become members of St John’s Bowling Club until 1972. Even then, only wives of current members were admitted and the numbers were limited to 10, increasing to 12 in 1980. The 1972 club accounts show 26 men and 5 lady members, the men paying 75p annual subscription and the ladies 25p. Records indicate the club was called St John’s Bowling Club up to and including 1970. However, the 1974 club accounts refer to St John’s (Meads) Bowling Club. The reason for the name change is not known, but perhaps a need to expand membership to fulfil an expanding fixture list resulted in an increasing number of members not being associated with St John’s Church. This would also coincide with the introduction of lady members. Even though both ladies and gents paid the same £1 annual subscription from 1978, it is interesting to note that not until an Extraordinary General Meeting was called in 2001 were the club rules changed to give ladies equal rights to hold office, including that of President and Captain. This decision did not meet with universal approval and was still a bone of contention at the 2001 AGM. Some have felt that St John’s will not be recognised in the town as a bone fide bowls club until it has a dedicated pavilion. That was possibly the case at the end of the last millennium when a Pavilion Extension Fund was started. At the 2000 AGM, locally renowned architect, JD Clarke, presented the pavilion extension proposals. £6,810 was in the fund, £3,885 donated by members on the understanding it would be repaid if the project did not go ahead. At the 2001 AGM Hugh Graham, EBC’s Project Officer (Sports & Recreation) reported EBC had allocated £85,000 for the pavilion extension in their 2002/03 budget and that he would be preparing a lottery bid application for a further £45,000. The lottery bid failed and in November 2002 £5,775 of the £10,417 in the pavilion extension fund was repaid to members. Unless further information comes to light it appears reasonable to assume the decision made a decade ago is sound and the St John’s Bowling Club was formed in 1936, when the Bowling Section of St John’s Men’s Society first played bowls at The Helen Garden.